Case Vacanza immerse nel verde, tra cielo, mare e la riserva dello Zingaro, nell'oasi dell' "Usciere", ad 1 km dal centro. 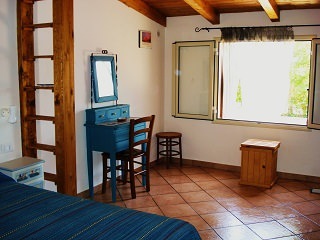 consists of a double bedroom with a sofa and a bedside table, a small kitchen and a bathroom with shower. The two-room type b) fall into this category two types of two rooms, “one” is composed of a bedroom, a living room with kitchenette and sofa, bathroom with shower, the ‘another is composed of a bedroom, a living room with sofa , a kitchenette and a bathroom with shower. The two-room type c) consists of a bedroom, a compartment intermediate between the bedroom and living room , living room with kitchenette and sofa , bathroom with shower. 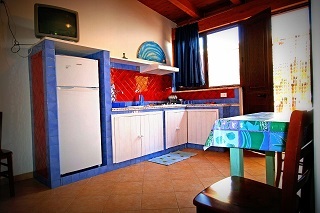 The two-room-type d) has a double bedroom, a twin bedroom , living room with kitchenette and sofa , bathroom with shower . All units have a covered terrace furnished with table and chairs, where is possible to eat and an area with sun loungers, beach shower, sink and washing hanging. Rates List 2019 of Villas per Week in Euro. You can also consult the "offers page" for some promotions ! n.b. for stays falling on two different months, the weekly rate applied will be that one includes more overnights. 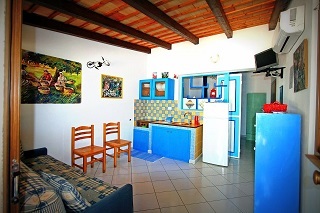 Utilities (water, electricity, gas), weekly change of bed linen and towels, initial and final cleaning of the accommodation, air-conditioning (in a correct way), TV and all the services offered. 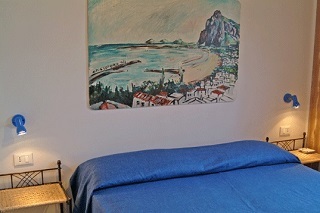 Share bed added € 70 ( type a), b), c) , d) ; tidying and cleaning of kitchenette at the time of departure, otherwise you will be charged the amount of € 15; extra linen, on request, € 15 ( bed/ bath per person); € 7 only bed ; € 8 only bath; local tax (Board resolution N.47 of 11/11/2014) that amounted to € 1 a day per person during the months of april,may,october,november and € 1,50 a day per person from 1° juin to 30° september, exemption of children within ten years of age; the same is applied up to a maximum of 15 consecutive nights. Arrival Saturday from 16.30 ( for organizational reasons it is not possible to anticipate the entry ) to 20.30. Departure Saturday before 09.30 am. ( previous control equipment , including linen ). To agree in advance any weekday arrivals and stay of less than a week. Guest of residents are not allowed, not even temporary ( the use of all spaces is only available to residents ), under penalty of expulsion. NO SMOKING ( inside houses ). at the time of booking . © 2013 Residence Holiday Houses Baglio del Sole | extension of Via del Secco s.n.c. Coordinate gps: LAT N 38° 10' 16.1" - LONG. E 12° 45' 40.8 "
Utilizziamo i cookie per assicurarci di darti la migliore esperienza sul nostro sito web. Se continui ad utilizzare questo sito, assumeremo che tu abbia prestato il tuo consenso.